Post by Bonnie Quinn, reposted from the Yellowstone Association Institute blog with permission. Opening weekend at the Lamar Buffalo Ranch (LBR) for the Institute is fantastic in so many ways. The seasonal program assistant volunteers arrive for training, excited and ready to start the star-studded field seminar season. The Weekend Warrior volunteers arrive, excited to see returning warriors, and ready to take on all of the deep cleaning, repair and get ready projects. It’s a joyous celebration of the Yellowstone Association family, lovers of Yellowstone and the LBR coming together from several western states to support the YA mission in the Lamar-velous Valley by preparing the campus for the season. Scopes and binoculars came out of the supply bus before everything except dinner supplies! They were set up on the front porch of the bunkhouse and we started scanning for neighbors right away. Incredibly, our first wildlife sighting included a grizzly bear sow and her two yearlings. They were off in the distance at the edge of the forest on Amethyst bench, rolling around and playing, scratching for roots to munch. The yearlings shone gold in the sunlight. Also seen nearby but not too close to each other, we found another grizzly bear sow with 2 two-year-olds, neither trio appeared concerned about the other. 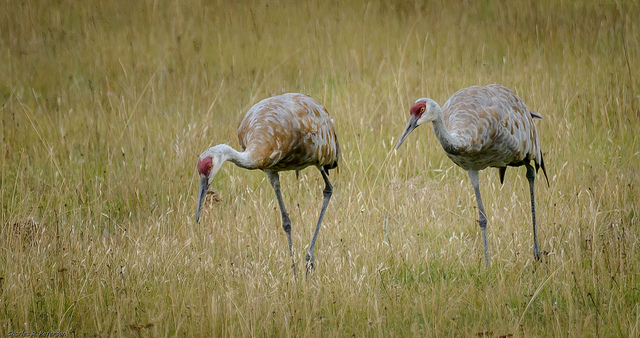 Sandhill cranes in Yellowstone. Photo by Charles (Chuck) Peterson, used under Creative Commons licensing. Four sandhill cranes circled the bunkhouse overhead, and then moved off to the middle hills of Specimen Ridge across the valley. Was that a family of four, parents and two colts of last season or two pairs, we wondered? Warblers and the ubiquitous robin are moving into campus. One robin is building her nest high in the peak on the front of the bunkhouse. A walk behind campus was especially enjoyable when we came upon the colorful shooting stars and creamy white phlox, gorgeous among the green grasses just beginning to pop up. 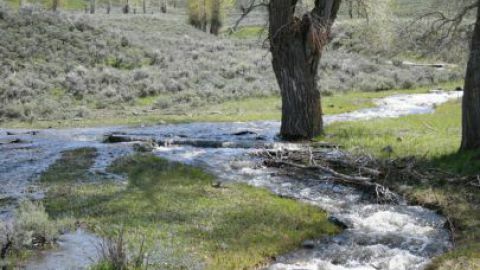 Rose Creek is full and overflowing its edges and the footbridge, rushing past the bunkhouse, carving a new channel and laughing out loud as it speeds to the Lamar Valley floor, where winding ribbons of water glow in the sunset. Editor's note: If you want to experience May at the Yellowstone Association Institute firsthand, enter our Rewilding Adventure sweepstakes to win a trip for two to Cristina Eisenberg's "Carnivores and Corridors" course at YAI!